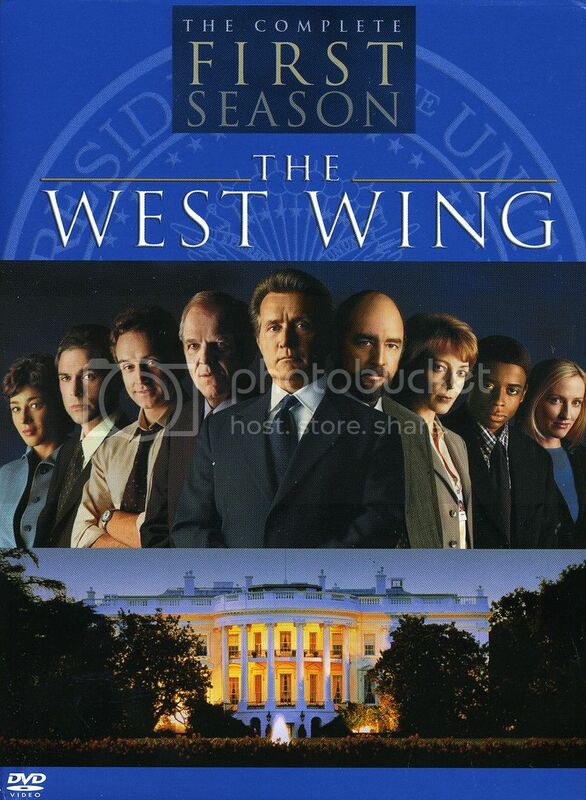 As is our wont, we're joining a party 17 years late to rush in and say: OMG, guys, have you seen The West Wing? It's so good! Just like Jesus Christ Superstar and Evita are about mobs; just like Star Wars is about false dichotomies; West Wing is about systems. Systems, systems, systems. And - since it's so goddamn optimistic and cleverly written - we find ourselves swept along: God bless America, indeed; God bless good institutions! Told mostly via lively walk-and-talk dialogues between a core group of intellectual idealists (the White House staff), led by the most intellectualest of them all, philosopher-President Jed Bartlet (a born-for-this-role Martin Sheen), The West Wing unpacks both the quotidian chaos and overall chaos of Politics in America with glee and gusto. This stuff is fun and fascinating, episode by episode by episode by SWEET GOD IT'S BEEN TEN EPISODES WE NEED TO GO TO BED NOW. Father Cavanaugh: I don't know how to address you. Would you prefer Jed or Mr. President? Bartlett: To be honest, I'd prefer Mr. President. Bartlett: You understand why, right? Father Cavanaugh: Do I need to know why? Father Cavanaugh: I didn't think it was. Bartlett: There's certain decisions I have to make while I'm in this room. Do I send troops into harm's way. Which fatal disease gets the most research money. Bartlett: It's helpful in those situations not to think of yourself as the man but as the office. Indeed, another thing we're often reminded about is that this group of idealistic, intellectual liberals are just one group in a long, long line of Presidents and staff: 44 such groups, so far! King George III: They say / George Washington’s yielding his power and stepping away / ‘Zat true? / I wasn’t aware that was something a person could do / I’m perplexed / Are they gonna keep on replacing whoever’s in charge? / If so, who’s next? We see systems come slamming down on the individuals when - for example - President Bartlet is shot (er, spoilers for season 1 stuff, whatever, we're like the last ones to have seen this). Everything goes batshit insane; Secret Service professionalism struggling to keep the blood and adrenaline and vomit from splattering onto everything (it does get on the cars). There's a wonderful quick moment - amid the assassination crazery - when the Vice President (Tim Matheson) is physically manhandled out of a low-stakes schmoozefest by a group of burly Secret Service officers: the look of fear on his face, marching with all those Secret Service hands on him, is - mwah - such perfect! Such writing! Such direction! This trifecta clash - humans, ideals, systems - runs big and small. Such as the problematic charm of newspaper journalist Danny (Timothy Busfield) rom-com courting the White House Press Secretary, CJ Cregg (Allison Janney): doesn't this violate some sort of check or balance? And yet - it seems so innocent! So soft and fun! And then there's the unfortunate byproduct of these glorious, insane systems: politics (ughh). That is, the cynical political machine: the machine that worries about polls, reelection, and popularity - often at the cost of ideals. It's wrenching to watch CJ struggle to disentangle the personal from the political in the wake of a gruesome homophobia-driven murder in season 1: and she's the face! She's got to keep a lid on it! And now: a loving paean to Toby. Oh, Toby Toby Toby. Like Season 3 Tigh, Toby is the heart and soul of the show for us: a hangdog Eeyore driven by seemingly limitless depths of feeling and intellect. And all conveyed with NOT ONE, BUT TWO, INCREDIBLE ACTING EYES. We doff our hats to Richard Schiff, who follows a Luigi Lo Cascio-esque style of acting: mostly stares (lots of staring), monosyllables, and lots of DEEPLY MEANINGFUL YET MUMBLED "okays" and "yeahs". Ah. So good. Incidentally, The West Wing Weekly podcast covered both the eternal shades of meaning in the show's abundant, Miles Davis-esque verbal tics ("yeah... okay."). Incidentally #2, the same episode has Richard Schiff co-hosting and confirming the eerie quality of hearing lines that weren't even said (INCREDIBLE ACTING EYE, I am telling you). And, frankly, we were touched by Schiff's still-fresh emotional resonance with the show's ideals. Phew. Okay. So it's amazing. Watch it. We'll keep watching. Five seasons to go, wooo. What's next?